Shipping within the 48 Continental USA $22, Alaska/Hawaii is $50, Canada is $60-75. All others please call. This Mud Flap is approximately 12 inches wide by 20 inches tall by 3/8 inch thick. The heat bend is typically a 20 degree bend placed 10” from the bottom of the mudflap, and leaves 10” of mud flap to be placed up inside the fender-well for attachment. Application: FRONT of All stock 1977 thru 1998 Ford Pickups. Mounting: Included Stainless Steel self tapping screws and washers. Serviceability: This mudflap includes a heat bend which is required on older model Ford trucks to leave the mudflap hanging straight down instead of hanging with a backward angle. Its’ ease of installation makes this a popular choice for earlier model Fords. This Mud Flap is approximately 12 inches wide by 22 inches tall by 3/8 inch thick. The heat bend is typically a 20 degree bend placed 12” from the bottom of the mudflap, and leaves 10” of mud flap to be placed up inside the fender-well for attachment. This Mud Flap is approximately 14 inches wide by 24 inches tall by 3/8 inch thick. The heat bend is typically a 20 degree bend placed 12” from the bottom of the mudflap, and leaves 12” of mud flap to be placed up inside the fender-well for attachment. Application: FRONT of All 1977 thru 1998 Ford Pickups with wider tires. Serviceability: This mudflap includes a heat bend which is required on older model Ford trucks to leave the mudflap hanging straight down instead of hanging with a backward angle. This Mud Flap is approximately 14 inches wide by 26 inches tall by 3/8 inch thick. The heat bend is typically a 20 degree bend placed 14” from the bottom of the mudflap, and leaves 12” of mud flap to be placed up inside the fender-well for attachment. This Mudflap is approximately 12 inches wide by 22 inches tall by 3/8 inch thick. The heat bend is typically a 20-degree bend placed 12” from the bottom of the mudflap, and leaves 10” of mud flap to be placed up inside the fender well for attachment. Application: REAR of All 1977 thru 1998 Stock Ford Pickups. Mounting: Included Stainless Steel bolts, nuts, washers and one galvanized steel bracket per Mudflap. Serviceability: This mudflap includes a heat bend which is required on older model Ford trucks to leave the mudflap hanging straight down instead of hanging with a backward angle. This Mudflap is simple to install and offers more flexibility for adjustment of length or to center on the tire. Protects your paint and towables. This Mudflap is approximately 12 inches wide by 24 inches tall by 3/8 inch thick. The heat bend is typically a 20-degree bend placed 14” from the bottom of the mudflap, and leaves 10” of mud flap to be placed up inside the fender well for attachment. This Mud Flap is approximately 14 inches wide by 24 inches tall by 3/8 inch thick. .The heat bend is typically a 20 degree bend placed 12” from the bottom of the mudflap, and leaves 12” of mud flap to be placed up inside the fender-well for attachment. Mounting: This Mudflap is bolted with included Stainless Steel bolts, nuts, washers and has two galvanized brackets per Mudflap to ensure stability in adverse conditions. Serviceability: This mudflap includes a heat bend which is required on older model Ford trucks to leave the mudflap hanging straight down instead of hanging with a backward angle. This is a popular Mudflap for occasional RV pullers and trucks that tow. It offers great protection for your truck and your towables. This Mudflap is approximately 14 inches wide by 27 inches tall by 3/8 inch thick. The heat bend is typically a 20 degree bend placed 15” from the bottom of the mudflap, and leaves 12” of mud flap to be placed up inside the fender well for attachment. Application: REAR of All 1977 thru 1998 Ford Pickup with wider tires, and requiring extra length due to a lift or to protect a boat or trailer. Mounting: This Mudflap is bolted with included Stainless Steel bolts, nuts and washers and has two galvanized brackets per Mudflap to ensure stability in adverse condition. Serviceability: This mudflap includes a heat bend which is required on older model Ford trucks to leave the mudflap hanging straight down instead of hanging with a backward angle. Mudflap of choice for professional hi way haulers and those that demand the maximum in protection for both their truck and towable. This is approximately 10 inches wide by 18 inches tall by 3/8 inch thick. Application: FRONT of all 1982 thru Current small Pickups, SUV’s and Vans. Mounting: Included Stainless Steel self tapping screws. Serviceability: Its’ ease of installation makes this a popular choice for the smaller trucks, vans or SUVs. 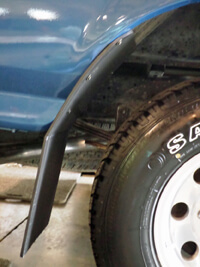 This 10″ wide mudflap will fit the front of all 1982 thru Current small Pickups, SUV’s and Vans. This is approximately 10 inches wide by 21 inches tall by 3/8 inch thick. Application: REAR of all 1982 thru Current smaller Pickups, SUV’s and Vans. This Ford F150 Mud flap, approximately 12 inches wide by 3/8 inch thick. Designed to hang approximately 8 inches below fender well. Application: FRONT of all 2015 thru Current FORD F-150 pickups with stock wheels and tires. Mounting: DuraFlap mounting hardware is made of aluminum where available. Other mounting products are made of anti-corrosive and rust resistant materials. Our pre-drilled Mudflaps are custom designed to utilize existing factory holes and other mounting points available on your truck. Instructions are included. Serviceability: This Mudflap is Pre-Drilled and allows for easy & precise alignment. This Mud Flap for Ford F150 is approximately 12 inches wide by 3/8 inch thick. It is designed to hang approximately 10 inches below the fender well. Application: Fits the FRONT of all 2015 thru Current FORD F-150 pickups with a small lift or slightly oversized tires. If your tires are oversized, you will want to make sure your tires will not rub on mud flaps hanging inside your fender well. This is especially important when turning the wheel. Mounting: DuraFlap mounting hardware is made of aluminum where available. Other mounting products are made of anti-corrosive and rust resistant materials. Our drill-less Mudflaps are custom designed to utilize existing factory holes and other mounting points available on your truck. Instructions and hardware are included. 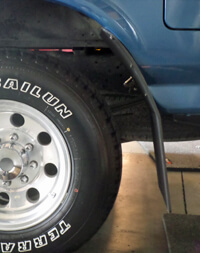 This Ford F-150 Mud Flap is a Pre-Drilled Mudflap, approximately 14 inches wide by 3/8 inch thick. Designed to hang approximately 8 inches below fender well. Application: FRONT of all 2015 thru Current FORD F-150 pickups with a slight lift and oversized tires requiring extra protection. Make certain that your tires will not rub on the mud flaps when they hang down inside your fenderwell. If this is a problem, see our lifted truck page. Mounting: DuraFlap mounting hardware is made of aluminum where available. Other mounting products are made of anti-corrosive and rust resistant materials. Our pre-drilled Mudflaps are custom designed to utilize existing factory holes and other mounting points available on your truck. Please note that if your truck does not have flares, you may need to drill one hole through the liner of your truck, but not into any metal. Instructions included. Serviceability: This Mudflap is Pre-Drilled and allows for easy & precise alignment. Please Note that if your truck does not have flares around the fender well, this mud flap will have a return into the fender well that is lower down on the fender well then our usual installs have. If your truck does have the fender well flares, the return will be at the normal height. This F150 Mudlfap is a Pre-Drilled Mudflap, approximately 14 inches wide by 3/8 inch thick. Designed to hang approximately 10 inches below fender well. Mounting: DuraFlap mounting hardware is made of aluminum where available. Other mounting products are made of anti-corrosive and rust resistant materials. Our pre-drilled Mudflaps are custom designed to utilize existing factory holes and other mounting points available on your truck. If your truck does not have flares, you may need to drill a hole into the liner of the truck, but not into any metal. Instructions included. This Ford F150 Mudflap is a Drill-less Mudflap, approximately 12 inches wide by 3/8 inch thick; designed to hang approximately 10 inches below the fender well. Application: REAR of all 2015 thru Current models of F-150 trucks with stock tires and stock suspension. NOTE: If you have added the full inner fender well liner, the fit up is different. Let us know on the questionnaire when ordering. Mounting: DuraFlap mounting hardware is made of aluminum where available. Other mounting products are made of anti-corrosive and rust resistant materials. Our drill-less Mudflaps are custom designed to utilize existing factory holes and other mounting points available on your truck. Instructions included. Serviceability: This Mudflap is Pre-Drilled and allows for easy & precise alignment. Please Note that if you have added the aftermarket rear fender well liner; this installation will require going thru the liner with an awl or drill to access the factory hole behind the liner. This Mud Flap for Ford F150 is a Drill-less Mudflap, approximately 12 inches wide by 3/8 inch thick; designed to hang approximately 12 inches below the fender well. Application: REAR of all 2011 thru Current models of F-150 trucks requiring extra length to protect a tow vehicle, or a truck with a slight lift. This Mud Flap for Ford F150 is a Drill-less Mudflap, approximately 14 inches wide by 3/8 inch thick; designed to hang approximately 10 inches below the fender well. Application: REAR of all 2015 thru Current models of F-150 trucks with over-sized tires that require additional coverage. Mounting: DuraFlap mounting hardware is made of aluminum where available. Other mounting products are made of anti-corrosive and rust resistant materials. Our drill-less Mudflaps are custom designed to utilize existing factory holes and other mounting points available on your truck. Instructions are included. NOTE: If you have after market wheels shifting your tires further out than the stock wheels, we can custom shift these mud flap to stay centered to your tires. Fill out our questionnaire and we will e-mail you all the information you need to get the perfect fit. This Ford F-150 Mudflap is a Drill-less Mudflap, approximately 14 inches wide by 3/8 inch thick; designed to hang approximately 12 inches below the fender well. Application: REAR of all 2015 thru Current models of F-150 trucks with oversized tires, requiring extra length to protect a tow vehicle, or a truck with a slight lift. This Ford F150 Mud Flap is a Pre-Drilled Mudflap, approximately 12 inches wide by 3/8 inch thick. Designed to hang approximately 9 inches below fender well. Application: FRONT of all 2004 thru 2010 FORD F-150 pickups with stock wheels and tires. Mounting: DuraFlap mounting hardware is made of stainless steel where available. Other mounting products are made of anti-corrosive and rust resistant materials. This pre-drilled mudflap is custom designed to utilize existing factory holes and other mounting points available on your truck. Serviceability: This Mudflap is Pre-Drilled and allows for easy & precise alignment. Please Note that if your truck does not have flares around the fender well, this installation will require drilling thru the plastic fenderwell liner. If your truck does have the fender well flares, this is a drill-less installation. This Ford F-150 Mudflap is a Pre-drilled Mudflap, approximately 12 inches wide by 3/8 inch thick. Designed to hang approximately 11 inches below fender well. Application: FRONT of all 2004 thru 2010 FORD F-150 pickups with a small lift or slightly oversized tires. If your tires are oversized, you will want to make sure your tires will not rub on mud flaps hanging inside your fender well. This is especially important when turning the wheel. Serviceability: This Mudflap is Pre-Drilled and allows for easy & precise alignment. Please Note that if your truck does not have flares around the fender well, this installation will require drilling one hole thru the plastic fender well liner. If your truck does have the fender well flares, this is a drill-less installation. This F-150 Mud Flap is a Pre-Drilled Mudflap, approximately 14 inches wide by 3/8 inch thick. Designed to hang approximately 9 inches below fender well. Application: FRONT of all 2004 thru 2010 FORD F-150 pickups with a slight lift and oversized tires requiring extra protection. Make certain that your tires will not rub on the mud flaps when they hang down inside your fender well. If this is a problem, see our lifted truck page. Serviceability: This Mudflap is Pre-Drilled and allows for easy & precise alignment. Please Note that if your truck does not have flares around the fender well, this installation will require drilling thru the plastic fender well liner. If your truck does have the fender well flares, this is a drill-less installation. This F150 Mud Flap is a Pre-drilled Mudflap, approximately 14 inches wide by 3/8 inch thick. Designed to hang approximately 11 inches below fender well. Application: FRONT of all 2004 thru 2010 FORD F-150 pickups with a slight lift and over-sized tires requiring extra protection. Make certain that your tires will not rub on the mud flaps when they hang down inside your fender-well. If this is a problem, see our lifted truck page. Serviceability: This Mudflap is Pre-Drilled and allows for easy & precise alignment. Please Note that if your truck does not have flares around the fender-well, this installation will require drilling thru the plastic fender-well liner. If your truck does have the fender-well flares, this is a drill-less installation. This Mud Flap for Ford F150 a Drill-less Mudflap, approximately 12 inches wide by 3/8 inch thick; designed to hang approximately 11 inches below the fender well. Application: REAR of all 2004 thru 2010 models of F-150 trucks with stock tires and stock suspension. NOTE: If you have added the full inner fender well liner, the fit up is different. Let us know on the questionnaire when ordering. This Ford Mud Flap is a Drill-less Mudflap, approximately 12 inches wide by 3/8 inch thick. Designed to hang approximately 9 inches below fender well. Application: FRONT of all 2011 thru 2014 FORD F-150 pickups with stock wheels and tires. Serviceability: This Mudflap is Pre-Drilled and allows for easy & precise alignment. Please Note that if your truck does not have flares around the fender well, this installation will require drilling one hole thru the cloth fender well liner. If your truck does have the fender well flares, this is a drill-less installation. This Ford F150 Mud Flap is a Drill-less Mudflap, approximately 12 inches wide by 3/8 inch thick. Designed to hang approximately 11 inches below fender well. Application: FRONT of all 2011 thru 2014 FORD F-150 pickups with a small lift or slightly oversized tires. If your tires are oversized, you will want to make sure your tires will not rub on mud flaps hanging inside your fender well. This is especially important when turning the wheel. Serviceability: This Mudflap is Pre-Drilled and allows for easy & precise alignment. Please Note that if your truck does not have flares around the fender well, this installation will require drilling thru the cloth fender well liner. If your truck does have the fender well flares, this is a drill-less installation. This Mudflap for Ford F150 is a Drill-less Mudflap, approximately 14 inches wide by 3/8 inch thick. Designed to hang approximately 9 inches below fender well. Application: FRONT of all 2011 thru 2014 FORD F-150 pickups with a slight lift and oversized tires requiring extra protection. Make certain that your tires will not rub on the mud flaps when they hang down inside your fender well. If this is a problem, see our lifted truck page.